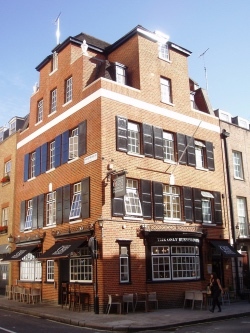 This Mayfair establishment dates from 1749 and was previously known as The Running Horse. It was popular among footmen in the service of the well-to-do of Mayfair at the time – their job was to run ahead or alongside their master’s coaches and ensure the path was clear as well as pay any tolls so the carriage could whisk through toll gates. They also carried messages when required as well as other tasks and such was their reputation for speed that races were apparently run upon which their masters would gamble. Anyway, so popular did this pub prove among them that one of them bought the property at 5 Charles Street, a stone’s throw from Berkeley Square, after retiring and renamed the pub after himself – I Am the Only Running Footman, a moniker which was at the time, one of the longest names for a pub in London. That name has since been truncated to The Only Running Footman and now just The Footman.